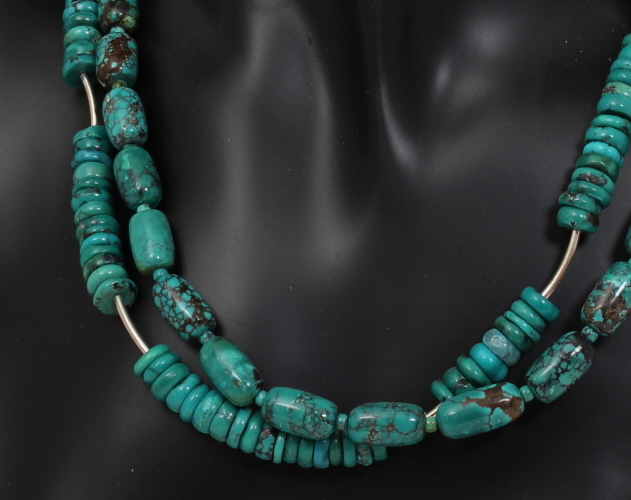 A simple, yet classic, design combining sterling silver and turquoise in this double strand necklace. 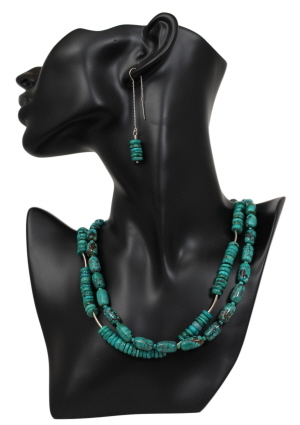 Even the tab-style clasp is accented with turquoise, meant to be shown off and would look exceptional with an up-do hair style. Necklace measures 18 inches in length. Earring measures 2¾ inches from top of U-bar to bottom of dangle. Weight 0.1 oz each. Stacks of turquoise disks dangle from cable chain, sterling silver ear threads. Center U-bar on ear thread increases comfort and maintains correct position as worn. Turquoise, the traditional birthstone for December and the anniversary gemstone for the 5th year of marriage.